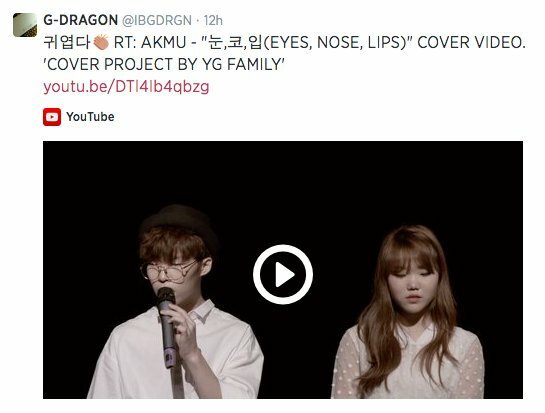 Akdong Musician (AKMU), a brother-sister pop duo, did a cover of Taeyang’s song “Eyes, Nose, Lips,” captivating K-pop fans. YG Entertainment released the video of the song on its official blog on Monday. Not only their talent, but also their unique style caught viewers’ eyes. After watching the video, G-Dragon posted “cute” to his Twitter with a link to the cover. Also, AKMU’s teaser image included “Cover Projects by YG Family 001,” which aroused viewer’s curiosity regarding who will be the next singer to do a cover.